Have you ever found yourself out and about, with your manicure completely chipped, makeup running down your face, lipstick everywhere, and hours away from the privacy of your own shower/powder room/vanity? No? Ummmmm, me neither . . .? But just think for a minute about that poor woman and what kind of day she must have been having. Wouldn't it be convenient for her to have some portable little helpers to get her through? La Fresh makes a wide variety of wipes in single sizes, and they generously sent me a few different types to review. First, let's talk nail polish removal. I always have a manicure, but occasionally something happens through the day that jacks it up (like the time I was using packing tape and it got stuck to several of my fingers, and when I pulled it off, I was missing large chunks of my mani). Now imagine you have a big meeting in an hour, or a date after work. You really don't want to go looking like a half-baked goofball who hasn't changed her mani in two weeks. 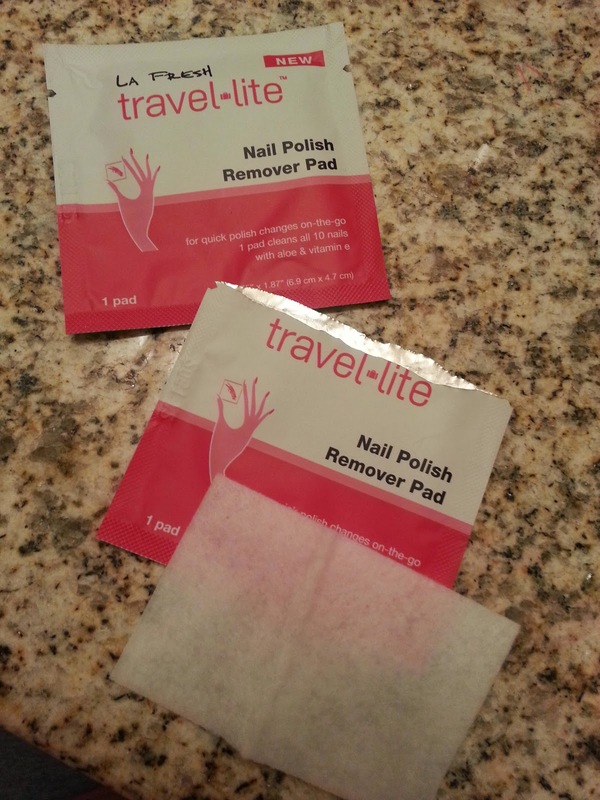 Thus, the nail polish remover pad! I've tried nail polish remover pads before, specifically Laqa & Co brand, which I reviewed in October. The La Fresh version was a bit different because it has a bit of texture to it, and it is bigger, whereas the Laqa& Co ones are smaller and seem to rely a lot on being very moist (and a bit messy). It's said to be big enough to remove all the polish from both nails. When I tested these out, I was wearing my five-layer Jelly Glitter Stampwich mani, the second layer of which was glitter, which is extremely hard to remove. Normally I would use the foil method, and regular nail polish remover is really not enough to remove a glitter mani, but I wanted to test these pads to their limits. They actually did a very good job of getting all the layers of color polish off my nails. I did have to add a bit of acetone and hold the pad over each nail for about 30 seconds to get the glitter off, but that's surprisingly effective compared to what would happen with a cotton ball. I probably could have gotten the glitter off without doctoring it with acetone if I had cracked open another wipe. I do feel confident these could easily remove a regular non-glitter mani. 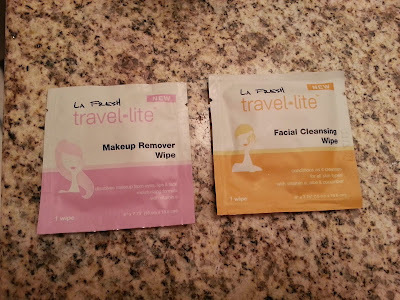 The other products I received were a makeup removing wipe and a facial cleansing wipe. I've tried tons of different cleansing wipes, and while they usually do OK for extreme circumstances, they don't really usually work all that well, and I kind of stopped using them. These are great, though! The fact that they are single use means they are fresh when you open them, unlike resealable packages which often dry out before you use up the wipes. Overall I do like the La Fresh wipes better than some other brands I have tried. I tried the makeup removing wipe twice. Once was at work when I had some red lipstick on and realized it was bleeding around my lips- a quick swipe of the wipe took care of it. Then that night, I had on a full face of makeup and used the wipe to remove it. Typically I use a liquid makeup remover to take off eye makeup, and it melts right off. This wipe was not quite that effective - it took a bit of scrubbing to get the makeup off, but it did a pretty good job and is much more portable than a liquid makeup remover. Normally I would then wash my face with a facial cleanser and water, but for this test, I followed up the makeup remover wipe with the facial cleansing wipe. It had plenty of cleanser on it, and overall I felt much more cleansed than I usually do when using wipes. I don't think I would replace my normal nighttime routine with these, but I would definitely keep them in my purse in case of emergencies and take them traveling with me. I was also thinking they would work well for post-workout cleansing, people who do dirty or sweaty work and like to clean up a bit before leaving, for outdoorsy people, or people who like to party and often end up waking up at someone else's place (don't pretend it's never happened to you! ).